My first concert featuring the revolutionary prog-rock group Genesis, was at London's Earl's Court in 1977, during the Queen's Silver Jubilee. Sadly, I saw them shortly after the departure of Peter Gabriel, but before guitarist Steve Hackett had left the group. By 1978, two of Genesis' greatest musicians were now gone, and many predicted their swift demise, however drummer Phil Collins would emerge from behind his kit to take the microphone, (replaced first by Bill Bruford and later Chester Thompson on drums), and alongside keyboardist Tony Banks and bassist Mike Rutherford, would propel Genesis to an unbelievably successful career. Now, some fifteen years after their last "farewell tour", Genesis returns to the Bay Area, (San Jose October 9th and Sacramento on October 10th), for the final leg of their "Turn It On Again" tour; rejoined by Thompson and guitarist Darryl Stuermer. "You've got to get in to get out..."
The USA Today's Mike Snider, recently wrote that although the group was "never a favorite with critics, Genesis built a solid fan base over nearly four decades. Now the band is ready for its victory lap. After the North American leg of the group's reunion tour opened in Toronto, Tony Banks, Phil Collins and Mike Rutherford will play what they say will be Genesis' final U.S. concerts. Then, as their hit goes, that's all. "Basically, this is the last time we are doing it," Collins says. That the band decided to turn it on again at all is a surprise. The three hadn't released a new album since 1991's We Can't Dance. 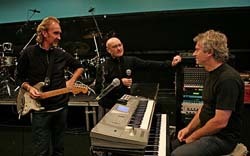 Collins, 56, officially left Genesis in 1996, and the group last toured in 1992. After his solo "first final farewell tour" in 2005, "I wanted to sort of retire from touring to be with my kids," Collins says. "If something special came up, I would do it. I just don't want to go on the road for long periods of time." But the group kept in touch over the years, playing impromptu gigs at birthday parties (when Collins turned 50) and weddings (for Collins and original singer Peter Gabriel). After two Genesis Archive box sets hit stores in 1998 and 2000, rumors of a reunion emerged. In 2004, the three met with ex-bandmates Gabriel and Hackett to discuss a live reunion to play 1974's concept album, The Lamb Lies Down on Broadway. "It would have been quite fun to do on a smaller scale," says Banks, 57. Gabriel was non-committal, so Collins asked Banks and Rutherford whether they wanted to get the three-man band back together. "We couldn't think of a reason why not to, really," Collins says. Only three of 22 U.S. shows have sold out, but multiple dates in Chicago, Philadelphia and L.A. are a testament to the band's following. ("Many places said we could do two or three nights," Collins says. "But if you do, pretty soon you have 50 shows. I kept putting a lid on it.") Genesis' return probably won't prove as hot a ticket as The Police reunion, says Pollstar editor Gary Bongiovanni. "The Police have been away longer, and Genesis with Phil Collins still doesn't have Peter Gabriel. So it is a question mark," he says. "But in Europe, they did good business and were playing stadiums." After the tour ends in October, Collins has nothing in the works. "I'm really looking forward to it," he says. "I've been playing golf. "Genesis, on the other hand, has many projects in the pipeline. Rhino released a new two-disc hits compilation Turn It On Again (Tour Edition), and in November, the second box set of remastered Genesis albums arrives. The band's free concert in Rome's Circus Maximus was recorded for a DVD due later this year. The autobiography Genesis: Chapter & Verse was due out Sept. 18. With this farewell tour and upcoming retrospectives, might the band emerge with an enhanced image? "Certainly, in England, the band gets overlooked," Banks says. "But, honestly, I'm not that concerned anymore. I'm pretty proud." Collins took the range of ages at the European shows as a promising sign. "We've had great reviews in Europe and the U.K. Maybe suddenly the (U.S.) critics could lower their agendas and just go there and say, 'This isn't bad.' "
I'm personally fond of the Gabriel era albums, Trespass, Nursery Cryme, Selling England by the Pound, and The Lamb Lies Down on Broadway, however Collins, and the much under-appreciated Banks and Rutherford were phenomenal on most of 1980's albums: The Wind & Wuthering, And Then There Were Three, Duke and Abacab. With the addition of the great jazz drummer Thompson, (Freddie Hubbard, Frank Zappa, and Weather Report), and Stuermer, (Jean Luc Ponty), Genesis' live shows were some one the greatest I'd ever seen, and alongside their peers; Yes, Emerson, Lake and Palmer, Jethro Tull and Pink Floyd, remained one of the greatest prog-rock bands of all time. "I know what I like. and I like what I know..."